Have you ever met someone and had the feeling that you’ve known them before? Not in a “your face looks familiar” kind of way, but rather felt an inexplicable familiarity when you look into that person’s eyes? Perhaps you’ve shared many lives with them or just one. You just feel it in your bones that this is someone who has been and will be important to you. So how do I know if I’ve met my soul mate? If you have a particularly deep soul connection, there will be a “freeze-frame” memory of the first moment you met that person. In other words, as we later reflect back upon the first time we met a particular person, we have a clear “picture” in our mind of all of the circumstances of that moment when that person first entered our lives. Soulmate relationships, while wonderful, are almost never pain-free. These people are brought into our lives to help us grow and as a result, they often challenge us more than others. When you find a soulmate it’s not just all jumping on clouds and smiling as you gaze into each other’s eyes for hours (though there is some of that). Lots of growth takes place when you find such a soul. Have an “our eyes connected across a busy room” story to share? Share it here. Doing intuitive relationship readings is one of my specialties – a relationship reading can provide you with insight as to the “why” you’ve met someone and can also point to past life karma you and another person share. Visit the relationship readings page for more information. Like what you read here? 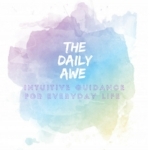 Subscribe to The Daily Awe! Or share this article with your friends, family and Facebook pals!